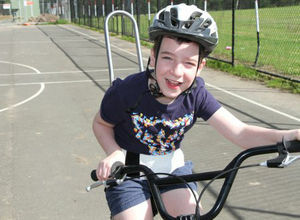 Ten-year-old Harry received his first Freedom Wheels bike last year and he absolutely loves it. A happy character has helped him develop a strong group of friends. He is living with cerebral palsy and uses a walker to get around school with friends always keeping an eye out just in case he needs a hand. Harry had shown an interest in riding a bike and the family tried many commercial options but none enabled Harry to ride independently, safely or confidently. He could only manage these bikes with difficulty and always assisted. “It was hard work for us as we usually had to run alongside him in case he fell off,” Mum Holly remembers. After major surgery to help with hip rotation, Harry faced two years of rehab and Holly feared that Harry’s progress in achieving more independence would receive a setback. As well as getting valuable exercise, bike riding would support his important physio goals in the process. After the struggles Harry had with his first bikes, Holly wasn’t too confident leading up to the assessment with TAD’s Occupational Therapist. 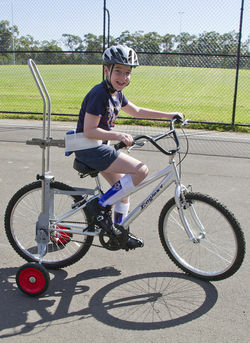 The assessment was to measure Harry up, consider his abilities and have a test bike custom designed and built. When Harry went for his initial ride on his Freedom Wheels bike it was a success. Harry was soon zooming around, riding independently and steadily without a hitch. Now Harry can go off on rides together with his Dad younger brother Archie while mum gets some quality time at home to recharge the batteries. The family is looking forward to their annual camping holiday when Harry can join all the other kids as they ride their bikes together.